The complete guide for overcoming IBS by discovering your triggers and building a personalized, doable, and fulfilling diet around nutritious, delicious foods that let you finally feel your best. 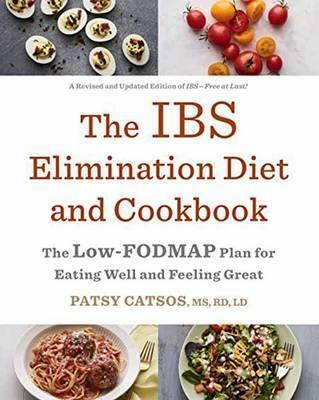 Patsy Catsos, MS, RDN, LD, pioneered the use of the low-FODMAP diet to find your unique FODMAP fingerprint when she self-published IBS–Free at Last!, ushering in a new era of treating IBS through diet instead of medication. Written for at-home use, her book quickly established itself among doctors and other specialists as an invaluable tool for anyone suffering from IBS, Crohn’s disease, ulcerative colitis, SIBO, and gluten sensitivity. This new, definitive edition offers the theory along with a program that walks you through eliminating FODMAPs (difficult-to-digest carbohydrates found in a variety of otherwise healthy foods) and adding them back one by one–the most usable, thorough program available. And its 56 delicious recipes, 24 full-color photos, and comprehensive guides to high- and low-FODMAP foods make this the bible of the low-FODMAP lifestyle. Here is your plan for eating well while finally feeling great. Note: This is the updated and expanded edition of IBS–Free at Last, including its landmark 8-step program.